Paranormal activity has met its match in the PC: Not a Max-von-Sydow-like Exorcist, but a ghost-hunting Scooby-Doo and his teen sidekicks. The following programs claim to detect visitors from the Great Beyond, or even organize your next ghost hunt for you. Whether you actually believe in this stuff is almost beside the point. It's Halloween—and it's just fun to see the meters, graphs, and even databases you can use to keep tabs on the local ectoplasmic activity. That spooky feeling you get while working alone on your PC, late at night, may not be your imagination. If there is a ghostly entity reading your Tweets over your shoulder, your PC may be able to detect it for you. XParanormal Detector analyzes anomalous changes in the signal (the rapid single flux quantum, if you want to dive that deep) of your Wi-Fi or network adapters. It communicates its findings onscreen through sensors, ghost radar, and graphs. There's a lot going on, but it all amounts to ghosts. Once you see some spikes in the chart, get ready for the action. Using the data, the program can spit out a word that a nearby spirit is trying to communicate. I was skeptical and bored at first, but after about ten minutes of letting the program run in the background, Microsoft’s text-to-speech chimed in, startling me, with the first word. I was reading through the FAQs of the program when I heard “enquiry.” Twenty minutes later, I heard the word “bread” as I was eating my lunch (which didn't contain any bread). Was it a coincidence, or a spooky specter spying on me? It’s tough to say. A built-in EVP (electronic voice phenomenon) device can be used to record up to a minute of sound through your microphone. Let a chatty ghost get a word in edgewise! If you buy the premium version ($19.95) you can capture up to an hour of EVP, and you can fill out log books to document your paranormal investigation, including an activity history that records every anomaly. 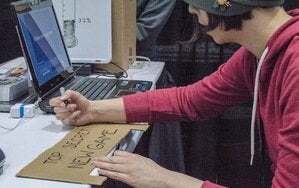 The company takes pains to market its product as entertainment. Regardless of whether you believe in what it does, it’s incredibly fun to have around. Run it in the background while using your PC to creep yourself out, or use it with friends to prove your place really is haunted. The free Basic edition doesn’t have much use past the novelty, but the Premium edition offers plenty for the avid ghost hunter. It's important to conduct a well-organized paranormal investigation, so you can marshal all the facts and evidence to convince the skeptics. Ghost-Tech Paranormal Investigator is a free tool to help you manage your ghostly outings. Organization is a ghost hunter's best tool. The program lets you catalog all investigators and paranormal-capturing equipment, so you can select what you need from a drop-down menu when you embark on a new investigation. Now, to document your ghost hunt: Fill in each section of the program, describing the location, initial reactions, investigation notes, interviews, and all the media you can muster. Be thorough! The program is a bit dull to look at, but incredibly useful. Plus, it’s completely free. Do you come home to find open cupboards, stacked chairs, and your laundry thrown about? (And you don't have a really flaky roommate?) Does your pet look terrified after spending a few hours alone? Time for some spooky sleuthing to see what's up when you're not around. 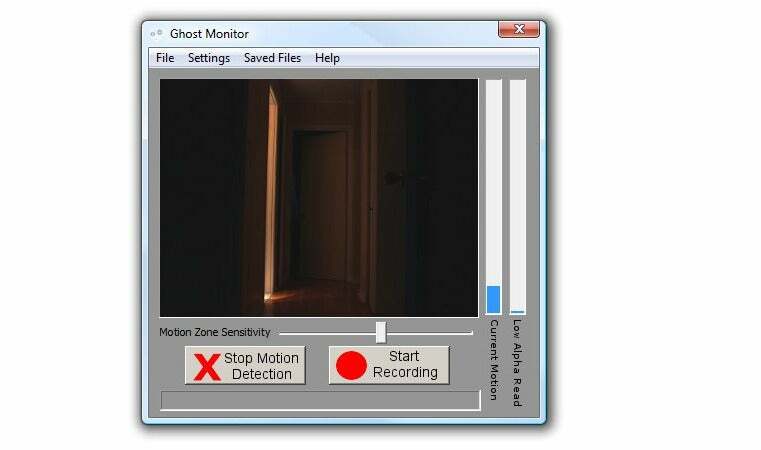 Ghost Monitor is a free program that sets up your webcam for ideal ghost-watching. It thrives in a dark environment, the creepier the better, and has the ability to focus on specific, strategic areas. A Pro version ($5.99) lets your webcam record at the highest resolution. What creeps around your house when you aren't looking? Once you set it up, you can choose to start recording or set the motion detector. The motion detector uses two algorithms: One tracks normal motion, while the other tracks “low alpha,” which senses changes in transparency and local luminescence. A sound trigger can be set up to start recording when any noise is detected. With this, it will also record an EVP session to go along with all your video recordings. Ghost Monitor really is the all-encompassing creepy recorder. So you’re more of the armchair ghost-hunting enthusiast. Lurking in damp, dark basements, or sitting out all night in the cold just isn’t your cup of tea. You’re in luck! Thanks to the Web, you can be on the lookout from wherever you’re sitting. Just search for ”ghost cams” to find a plethora of purported peeks at paranormal activity, set up in some iconic haunted locations and run 24 hours a day for your viewing pleasure. For instance, Willard Library is the oldest public library building in Indiana, and home to plenty of spooky stories, sightings, and the resident Grey Lady that hangs out in the children’s reading room. Cams have been placed all over the building and give viewers a chance to capture a screenshot and submit it as proof. The high-tech meets low-tech when it comes to talking with ghosts. With all this talk of high-tech ghost hunting, it’s important to remember the low-tech way to talk to ghosts. With Brainjar.com’s Ouija board, you can ask questions to the ghost in your machine and assist the planchette in spelling out the answers. Sure, maybe it’s just programmed to come up with the best answer, but you never know!